It is common knowledge that if you look at a map for long enough, strange cravings for travel begin to stir in the soul. But did you know that, alongside acute wanderlust, staring at a map can also induce a burning appetite? Yes, the latest research, when it's not arguing with itself over the pros or cons of a daily glass of red wine, really does bear this out. Here at Strumpshaw, Tincleton & Giggleswick - nutritionists extraordinaire - we've donned white lab coats and tucked enormous napkins into our shirt-tops to bring you our scientifically-proven top 10 most flavoursome places in Britain. 9. Burgar (Orkney Islands) - How can such a small area of land contain so many foodie places... Fillets, The Kettle, Stews, Dishes, Feastown and Barrel of Butter to name a few? 10. A tie between Belchford (Lincolnshire) and Burpham (there are two - Surrey and West Sussex) - The time-honoured way to finish a great meal! We do hope you've enjoyed dining with us. 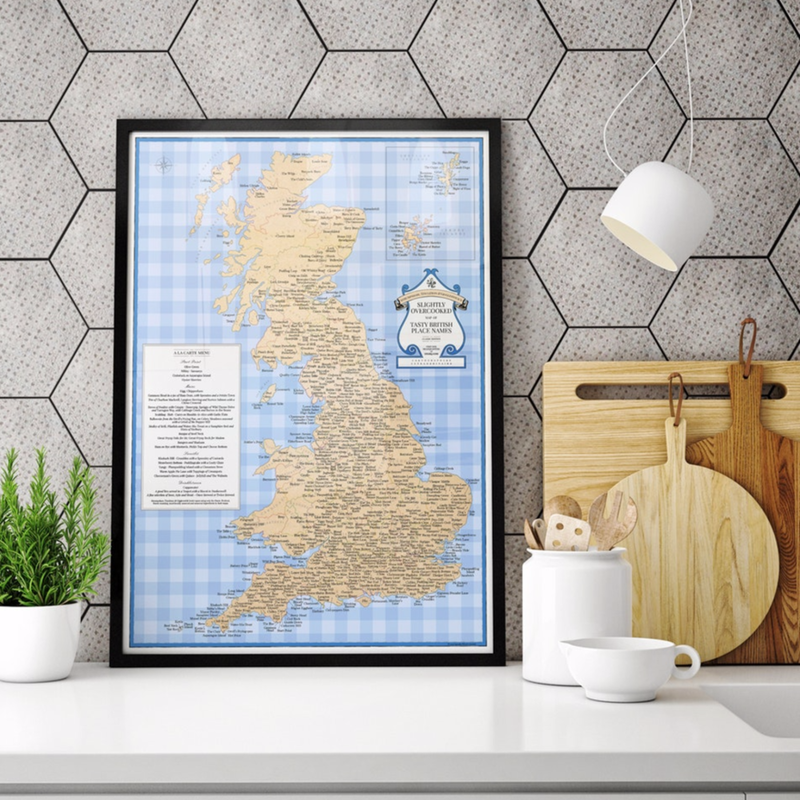 To experience the taste sensation of over 700 tenuously food-and-drink-related places, including our top 10 above, take a look at our Slightly Overcooked Map of Tasty British Place Names. ST&G insist on using only the finest, freshest, freest-roaming, most locally-sourced and seasonal ingredients in their maps. And just a hint of pomposity. Bon appetit!